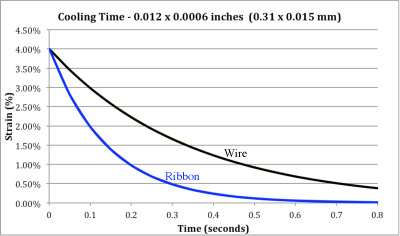 The following chart gives rough guidelines for how much electrical current and force to expect with various ribbon sizes. When Flexinol® actuator ribbon is used within the correct range then obtaining repeatable motion from the ribbon for tens of millions of cycles is reasonable. If higher stresses or strains are imposed, then the memory strain is likely to slowly decrease and good motion may be obtained for only hundreds or a few thousand of cycles. The permanent deformation, which occurs in the ribbon during cycling, is heavily a function of the stress imposed and the temperature under which the actuator wire is operating. Flexinol® actuator ribbon has been specially processed to minimize this straining, but if the stress is too great or the temperature too high some permanent strain will occur. Since temperature is directly related to current density passing through the ribbon, care should be taken to heat, but not overheat, the actuator ribbon. 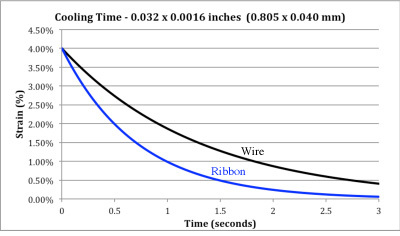 The following chart gives rough guidelines as to how much current and force to expect with various ribbon sizes. * The pulling force is based on 25,000 psi, which, for many applications, is the maximum safe stress for the ribbon. However, many applications use higher and lower stress levels. This depends on the specific conditions of a given design. *** Approximate cooling time, at room temperature in static air, using a vertical ribbon. The last 0.5% of deformation is not used in these approximations. HT = High Temperature Flexinol® Actuator Ribbon. FLEXINOL® and Muscle Wires® are Registered Trademarks of DYNALLOY, Inc. Copyright © 2019 DYNALLOY, Inc. All Rights Reserved.